Paul Butler of Dog River Aternative Fuels stands with some of the used cooking oil his company will turn into biodiesel, a biodegradable fuel. Take a whiff of the exhaust from Paul Butler's car and you know something's cooking. The fumes won't make you gag. If anything, they'll make you hungry. They give off an odor rather like, well, French fries. What you've smelled might be the future, and its name is biodiesel — an alternative fuel that is catching on with some eco-savvy Vermonters. Biodiesel is basically refined vegetable oil. The "diesel" refers to the kind of engine that can burn it. The University of Vermont has started filling its shuttle buses with the stuff. And this weekend, the school will feature the earth-friendly energy source as part of a well-timed symposium entitled, "After Oil: The Future of Personal Transportation." Biodiesel has advantages. You can run it in tractors. In cars, it can get 45 to 55 miles per gallon. It burns much cleaner than diesel fuel and you don't have to worry too much about spilling. "It's messy and it's greasy," says Butler, who is vice president of Dog River Alternative Fuels. "But it's biodegradable." And unlike foreign crude, fuel that's made from legumes doesn't have to come from places like Alaska and the Middle East. You can make it right here in Vermont. You can even refine it in your backyard, and the basic ingredient is something you'll find in your kitchen, using pretty much any kind of vegetable oil: soybean, mustard seed, rapeseed, whatever. "Learning how to make it is a lot of fun," says Terry Mason, a flight-school instructor who lives in Wolcott and used it to heat his house with home-brewed bio fuel. The process involves collecting the waste oil in a barrel and raising its temperature to 120 degrees, then mixing in methanol and lye. The only byproduct is glycerin — a primary ingredient in soap — which is biodegradable. Still, you don't want to get sloppy when making the stuff. "You have to be careful with the chemicals," cautions Mason. "Lye is corrosive to the skin and methanol puts off chemicals that don't do your lungs any good." Butler and his five partners at Dog River are going one step further, testing biodiesel in local home furnaces and vehicles. The goal, he says, is to make the product more widely available. "We hope someday to be making biodiesel on a commercial level in Vermont." Adam Sherman, manager of Intervale Compost Products in Burlington, has an admittedly fanciful idea: getting biodiesel from sunflowers. Sherman, who has used some of the fuel in farm equipment operated in the Intervale, sees producing vegetable oil for fuel as a way to help Vermont's struggling farms. "If we could be growing sunflowers [or other veggie oil sources] all over the state and pressing that," he suggests, "we could keep it local." And if you think the state is a tourist magnet now, just think how quaint it would look to flatlanders with all those yellow flowers waving in the wind. The idea behind biodiesel isn't some new, wide-eyed fantasy. It's actually an old concept from a smart German engineer. When he devised his innovative engine in 1893, Rudolf Diesel — yes, that's where the name came from — ran the prototype on peanut oil. However, he discarded legume-based locomotion when petroleum-based fuels became cheaper and more abundant. The idea for farm-based cars doesn't end there, however. During the 1920s, Henry Ford created a car body from hemp resin, then clobbered it with a crowbar to prove its durability. Biodiesel doesn't have be farm-raised. It can come from restaurants. Dog River picks up waste oil from eateries that otherwise would have to pay to have it hauled away to the landfill or to an out-of-state rendering plant where it would be turned into a substance used in dog food and cosmetics. 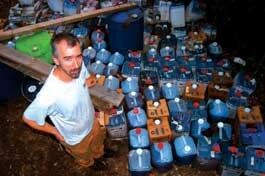 Paul Scheckel, an energy efficiency specialist and backyard biodiesel hobbyist who lives in Calais, is also into take-out waste oil. He uses the fuel he makes to run his '85 Volkswagen GTI diesel, as well as in a backup generator for his solar-powered home. In recognition of the greasy stuff's earlier incarnation frying squid, he calls his GTI the Calamari Cruiser. Assuming you get waste oil for free, Scheckel says, "You can make it for less than 50 cents a gallon." Unlike oil and gas refiners, biodiesel makers tend to work in small volumes and without government subsidies. So their products retail for more. Dog River charges its biodiesel pilot project members $1.90 a gallon for on-road use. Regular diesel fuel costs about $1.50. Eventually, Butler says, he would like to get federal help to lower his price. But he doesn't expect it from the oil-soaked Bush administration. "This is oil," he says, "but it's just not their kind of oil." Before they can make the leap to a full-fledged commercial venture, Dog River must clear some daunting regulatory hurdles, Butler says. Like Environmental Protection Agency tests geared toward companies that can shell out a million bucks to prove their product is safe. Until it does, the company will have to content itself with selling to pilot project members like the University of Vermont, which signed up with Dog River in 2001. Currently, four of the school's seven buses run on fuel that is 20 percent biodiesel and 80 percent regular diesel. So far, UVM transportation manager Michael Altman is pleased with the results. "We haven't had any problems with it," he says. But he also notes that the program has yet to stand the test of a severe winter. Even so, Altman plans to convert the school's entire fleet to biodiesel as soon as Dog River can meet the demand. Convert-ing is easy, he adds. On buses made before 1995, mechanics just have to replace rubber fuel lines with synthetic ones, since biodiesel can break down rubber. Once the entire fleet is converted, UVM's shuttle buses, which transport 600,000 passengers a year, will burn 3,000 gallons of biodiesel annually, preventing 66,000 pounds of carbon dioxide from being spewed into the atmosphere. In the meantime, individual drivers have another incentive for powering their cars with Friolator fodder. Sleepy Hollow Lodge, a touring and biking center in Huntington, offers a free day's pass to anyone who shows up in an environmentally friendly car — solar, electric or biodiesel. Owner Eli Enman uses biodiesel himself to run his new diesel VW Jetta and the tractor he uses to groom the trails. But he knows getting others to switch will be a harder sell. "Hopefully, things will change," Enman says. "Either the price of gas will go up or people will realize the horrible effects of being dependent on fossil fuel." Those range from environmental degradation to the promised invasion of Iraq. Best-selling environmental writer Bill McKibben isnt the only celebrity coming to the University of Vermont After Oil symposium this weekend. To hear organizer Andrea Grayson talk about it, the former New Yorker staff writer and author of works including The End of Nature is sharing the weekends top billing with a car. A Ford Focus, to be precise. But not the standard, bottom-of-the-line model you might have seen on the lot. Under its standard-issue skin, this Focus sports the hydrogen fuel-cell technology that Ford is gambling will one day replace the internal combustion engine. Environmentalists hope that someday everyone might drive such contraptions. The vehicles have zero emissions and run on hydrogen, which can be produced in the United States. Adios, OPEC, and so long, smog! Solar, electric, biodiesel, hybrids  all these promising fuel technologies will be on display and available for test drives. The morning is dedicated to under-the-hood demonstrations of electric cars, propane engines, compressed-natural-gas vehicles, hybrid cars, and hydrogen-fuel-cell technology. The afternoon features a talk by McKibben and panel discussions on the political and scientific issues involving alternative fuels. As for that Focus prototype, a Ford executive says you cant really call it a $7-million car. It is very difficult to put a price tag on it, comments Anthony Eggert, manager of Fords California Fuel Cell Partnership. But suffice it to say, Ford has invested hundreds of millions of dollars in the technology so far, he adds. After Oil: The Future of Personal Transportation takes place on Saturday from 10 a.m. to 5 p.m. by Patrick Gymnasium at the University of Vermont. The event is free. For info, call 656-2085.